Fast Optical Tomography is a unique way of generating 3D images of regional brain blood volume and oxygen. 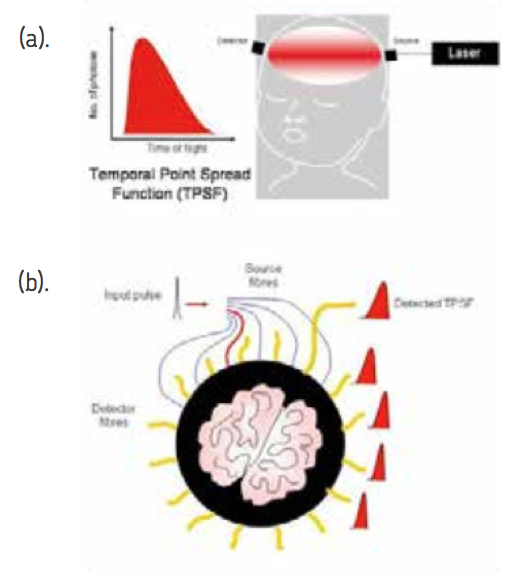 Using the technique of time resolved spectroscopy, pico-second pulses of photons are sent across the baby’s head. For each source the time taken for each photon to reach the detector is measured. The sophisticated electronics is able to detect the time taken for light to travel across the head in the space of a few nanoseconds. Unique graphs of the time taken for photons to cross the brain are generated for each source-detector pair (a). These graphs contain information on the absorption and scattering of light as it passes through the brain, and hence information on regional blood flow and oxygenation. Each of the 32 sources is activated sequentially and photons detected simultaneously from all of the detectors (b). Images are generated using a sophisticated computer program which models the paths of photons across the brain, compares model data with acquired data and changes the model iteratively until there is acceptable convergence between model and acquired data. The optical imaging scanner, known as MONSTIR 2 – Multichannel Optoelectronic Near-infrared System for Time resolved Image Reconstruction – was developed by the Biomedical Optics Research Laboratory at UCL (see here for information on the original instrumentation). The scanner was transferred to the Rosie at the end of 2014. The light sources and detectors attach to the infants head using a similar cap to the optical-EEG system. Preliminary test studies on adults have been completed and we have begun to scan infants in 2015.